We like good vinegar, and are delighted that we can now find several excellent brands and types that are OU kosher certified. Yes, vinegar requires kosher certification. Apple Cider Vinegar- This is the sweetest in our vinegar collection. We find it the best addition to our slaws – broccoli, cabbage and vegetable slaw. We use wine vinegar in our salads - especially when we make Italian vinaigrette. Organic DeLaRosa (OU) is our favorite. It is even kosher for Passover. For convenience however, if you can’t find this brand, Heinz wine vinegar is also certified OU kosher. Rice Vinegar – We use this in Asian salads, sushi and cooked rice. We consider it neutral vinegar – very much like neutral oil. and cannot really taste a difference in brands. Most supermarkets offer several kosher brands - and we purchase organic varieties when possible. Malt Vinegar – We have had the same bottle of Heinz Malt vinegar for 3 years (hope it’s still good). We use it solely for fried fish- especially when we make fish and chips. Distilled White Vinegar – We occasionally use this vinegar in Cole slaw, but most often for house cleaning chores. It works well on glass, wood floors and even cleaning produce. There are many kosher brands.We have included a recipe for using distilled vinegar as an ingredient in homemade vegetable wash.
Balsamic Vinegar is our newest vinegar passion…it is fun to use and adds a taste of both tartness and sweetness to foods. 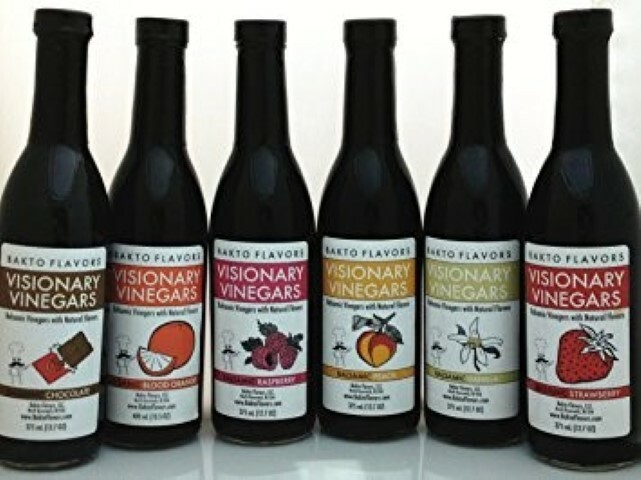 Through the recommendation of a friend and reader, we recently discovered Bakto Visionary vinegars. What a great find. We have been “playing” with Visionary Vinegar’s classic, strawberry and vanilla flavor. So what do we do with them? Everything and anything. Balsamic is a mild, slightly sweet vinegar. The classic balsamic flavor is a basic addition to dressings, sauces and salads. We particularly enjoyed adding it to our caramelized onion marmalade, (aka vegetarian schmaltz) roasted vegetables, and glazed salmon. As summer approaches, we will use balsamic over our Caprese salad (mozzarella, tomato and fresh basil). The flavored vinegars are delicious as a drizzle over fruit and ice cream, or in green salads especially in fruity salads, such as those containing mangos, dried berries, raisins or mandarins. Bakto is available in several flavors including Blood Orange, Chocolate, Classic, Passion fruit, Peach, Pomegranate, Raspberry, Strawberry, and Vanilla. For more information, or to order Bakto online, Click HERE! De La Rosa vinegars can also be ordered online – visit De La Rosa Vinegars to view their wide range of products including organic Italian and aged vinegars. And finally, We are still searching for a good kosher option for champagne vinegar. Anyone have suggestions? Yes, there really is a Mina behind this shakshuka sauce. Mina is from Morocco, and has journeyed the world with her family’s recipes, which were passed down through generations. As a young girl, Mina managed the cooking for ten younger siblings, making her mother's treasured recipes her own. Mina’s cooking talent set her on a journey from Morocco to Paris to New York where for years she served her specialties to private clients . Now, the Mina brand is enjoyed globally. Mina’s recipe uses only all natural ingredients…“tomatoes, roasted peppers, onions, garlic, extra virgin olive oil, cilantro, parsley, and a secret blend of 6 Moroccan spices. 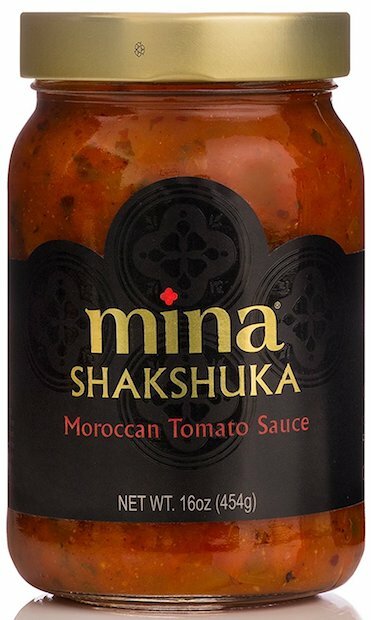 Simple, savory, and sizzling with flavor,” Our first taste of Mina’s special sauces was this OU certified shakshuka sauce. What a fabulous dish resulted. La Tourangelle has been known over the years to offer exceptional oils. With origins in the Loire Valley of France, La Tourangelle is one of these few remaining oil mills keeping this heritage alive in Saumur, France, and since 2002, in Woodland, California. It is a family-owned company. Over the years, KosherEye has used La Tourangelle stir-fry oil, wok oil, toasted sesame oil and roasted walnut oil. We enjoy the extra layer of flavor that the infused oils add to our dishes, and the confidence that the oil complements the food. Now we are fans of one of their newest products AvoCoco oil. We have been working with it for the past two months, and agree with the buzz --. It is an ideal butter substitute for sautéing, frying, searing and baking. We also like it mixed into salad dressings. AvoCoco is a healthy parve substitute for butter, due to its high level of unsaturated fats. It is a mix of organic coconut oil, avocado oil and organic sunflower oil. For frying (Yes, we do a lot of that in the south) we find that it has a neutral flavor coupled with a high smoke point. Perfect! La Tourangelle AvoCoco is kosher certified by the Star-K. Visit the La Tourangelle website for recipes and oil info. Combine all ingredients and then add oranges. We attend trade shows throughout the year to find the newest in food, wine, housewares and entertaining accessories for feature. As some of you know that before there was a KosherEye, we founded and operated a large party store in Atlanta. So, we consider ourselves tabletop mavens and are always looking for beautiful dinner and servingware. When Sophistiplate sent us some tableware to try, we knew that this new line was an answer to our search. The patterns are beautiful, stylish, elegant, and DISPOSABLE! We simply love this brand which is headquartered and shipped from Laguna Beach, California. A father and son team, Gary and Daniel Seehoff, conceived of Sophistiplate while traveling in Europe. They are both housewares industry veterans, with a passion for innovation and design. Daniel also holds a degree in hospitality and is a professionally trained chef. From Daniel, ”Our goal at Sophistiplate is to elevate disposable tableware to new heights, offering gorgeous items that you can mix and match easily to curate a stunning coordinated table setting”. The tableware had to be convenient, but with the WOW factor. It is! At this time of year, Jewish homes tend to have more guests than we have dinnerware placesettings, so Sophistiplate is the perfect stand-in for the real thing. Additionally, since many of us do not use our dishwasher on Shabbos or Yom Tov, disposables help with the messy factor we face after each meal. And, yes as we know, there are lots of meals and lots of mess! We will be setting our table from time to time with the beautiful Sophistiplate tableware, and photographing it to share with our readers. 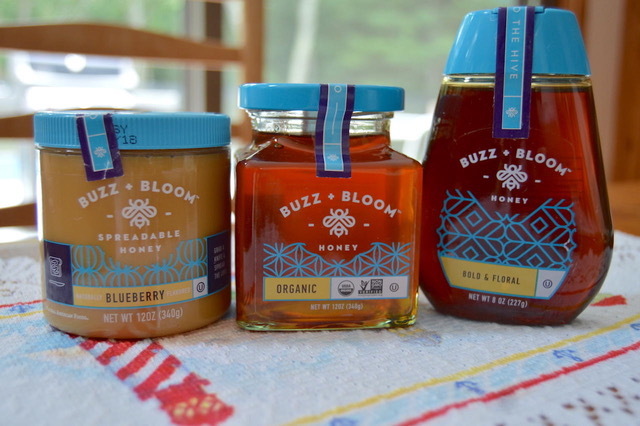 We learned about Buzz + Bloom at the Fancy Food Show. We were initially attracted to this OU kosher certified brand because of their beautiful honey jars, designed to depict “the global, honey-making relationship between the honeybee and the flower”. Whether it is a lychee fruit tree or fresh citrus groves, the company offers a diverse line of honeys, sourced all over the world. The brand has no artificial ingredients, flavors or preservatives, and is gluten-free, fat-free and nut-free. Buzz + Bloom honeys are easily recognizable by their bright blue caps. Honey does not spoil. If you see crystals form in any honey jar, simply put the honey in the microwave for a few seconds. Oil a spoon or measuring cup before filling with hone. It will release easily! If honey has crystallized, put it in the microwave to heat for a few seconds.